Hi everyone! Today I have a super yummy crockpot pork chop recipe for you! This one seriously doesn’t get any easier, and it was definitely a crowd pleaser for everyone at the Confessions household. And that is quite impressive since there is usually one person who isn’t thrilled with dinner. So let’s get on to dinner shall we? 4-6 bone in pork chops depending on your family size. 1 can filled with water or milk depending on how creamy you like your gravy. Combine the soup with the milk or water in a bowl. Pour more soup over that first layer, then add another layer of pork chops, another layer of soup, and another layer of pork chops. Finish your layers with a final layer of soup. The pork chops will be VERY moist and tender, and will fall right off the bone! Place some in a plate then top with a little of the gravy mixture left in the crock pot. I like to serve this with mashed potatoes and your favorite veggie. For a little more flavoring you can add in one dry mix packet of Ranch Dressing to the soup mixture! Yum! So that’s it, my super easy, yummy, and comfort food recipe for any night of the week. I hope you enjoy it, leave a comment below if you try the recipe! Have a favorite crockpot recipe to share? Make sure to leave a comment below! For more fun meal ideas, check out my Recipe page! I love top add frozen peas into soup mix and serve this over rice. Yummy. It’s so funny that I’m reading this right now – I have one hour cooking time left on my crockpot with these EXACT ingredients inside, except that my soup is cream of chicken and mushroom! 🙂 Soooooo yummy! Or rice, or toast, . JUST GOT THIS ON FOR DINNER TONIGHT—-I OPENED TWO CANS OF CUT GREEN BEANS (DRAINED & ADDED TO THE CHOPS & SOUPS! 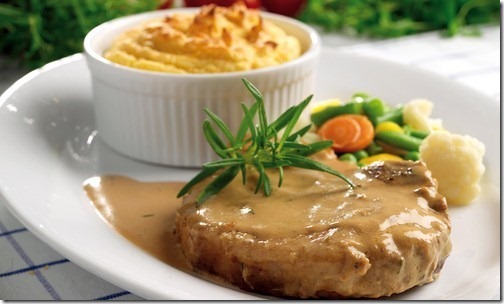 Do you start with the pork chops frozen or thawed? Do you need to change cook time for boneless chops? Delicious Looking Recipe! I can’t wait to try it. I’ve been on brining binge with porkchops lately. I usually use about 3-4 cups of water, a cup of apple cider vinegar, and about 1/4 cup of salt. I usually add some fresh herbs or pepper corns to this mixture. It can then marinate for as long as you like or for 30 minutes at room temperature. Rinse in cold water and pat dry with paper towels when you are done. I usually finish them by browning/searing for about 5 minutes on each side in a cast iron skillet. You know it is done searing when the pan releases it (don’t add any oil to the pan). Pop it into a 400 F degree oven to finish. It can take 5-15 minutes depending on the size and thickness of chops. Alternatively, just pop the chops in the 400 F degree oven for 10-20 minutes after brining. You don’t get the nice browning on each side but it is a bit easier to do larger batches. Either way, check with thermometer to make sure you get above 160 F which is medium. If you like your pork more well done, cook to F.
Cooking pork to well done/a brick is no longer necessary as commercial pigs are lower in fat and 145 F kills Trichinosis (http://www.bonappetit.com/blogsandforums/blogs/consciouscook/2009/12/is-it-safe-to-eat-medium-rare.html). There were literally 11 cases between 2003-2007 and none of them came from commercial raised pork. They came from wild game, bear meat, and home-raised pigs. Brining makes the chops so tender and delicious. They don’t come out overly salty, most of the salt stays in solution. The rest gets sucked into the muscle fibers which retain more water and don’t get so dense after cooking. When you don’t have much time to actually make mashed potatoes you can drop peeled cubed potatoes on top and they are ready to serve with the pork. Yummy meal, thanks for this post! Looks delicious, and easy! I might actually try this recipe out! thank you! The simple recipes are often the best. This was truly so easy and my entire family, of six, loved it! Which is a HUGE achievement. Also, made your calzones. Oh my goodness, they have asked for them daily. We’ve had them twice in a weeks time. Thanks for all your work and effort you put into your site.